In contrast to the blue suits, black suits have always epitomized the ultimate, classic look for men. But could that be about to change? Recent trends have seen a different suit color gain in popularity, without sacrificing elegance or panache. That color is blue. In this article, I want to explore this trend. I’ll show you how to master the blue look, and I’ll explain a number of color combinations ideal to keep you looking sharp and cool. All without appearing attention seeking or loud. No matter what the occasion, or which time of the day or night. You too can carry off the vibrant blue look like a real gentleman. 1 Is Blue the New Black? Picture the scene: You’ve just bought yourself a new suit for a family wedding. At the last minute, you change your mind. 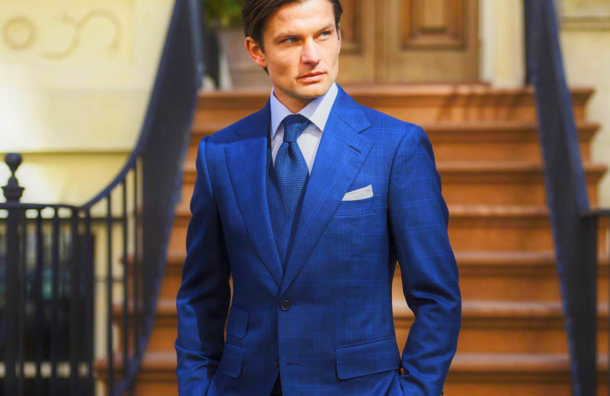 Instead of the other suit color you have chosen before, you go for the sharp blue suit you saw in the store window. It fits you perfectly, and when you glance in the mirror, you smile and silently congratulate yourself on looking super-good. In fact, you’ve never looked so elegant and charming and this slowly dawns on you. But what happens after the wedding? Will you ever wear it again? Sure enough, your blue suit was a hit at the time. But then you get home and hang your suit in the wardrobe. Sound familiar? Well, it doesn’t have to be that way. Blue can be a challenging choice, and it takes a level of courage to pull it off. But with the right color combinations and appropriate, matching accessories, it can make a bold statement. Blue projects confidence and daring. And I’m not talking about navy here. Navy is almost as safe a bet as classic black and is a reliable option at any event. No, I’m talking about blue as an ocean. Blue is synonymous with versatility, and could definitely prove to be the new black. A blue suit can be dressed down or up, according to the season, and time of day. What’s more, the color cries out to be united with a wide variety of other color combos. 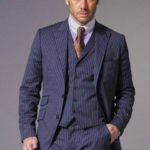 Besides, these suit combination ideas open up a whole world of expansive styles that allow you to display your creativity. Blue suit and shirt combinations alone, serve to unlock an entire realm of possibilities. Well-tailored, bold blue suits have arrived at center stage. Nobody is going to mistake your blue suit for a black one. Not any more. Blue sets you apart. The color works well with a plethora of combinations, and it slims the figure too. There’s a lot of men out there working their way into blue suit combinations right now. And they’re having a whole bunch of fun doing it, too. 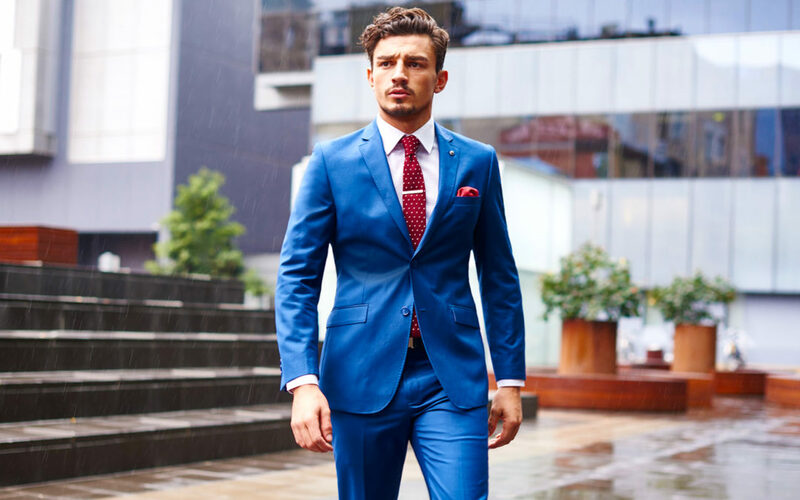 From weddings, first dates, to everyday office wear, your blue suit-based combo creates an elegant and sophisticated look. Especially when accompanied by the right shirt, shoes, and tie. But this is nothing new. Men with their finger on the fashion pulse have been wearing blue suit combinations for years. A sharp wardrobe is a considerable investment. It deserves to be researched and planned in advance. Which is why I’ve put together this detailed guide to blue suit styling tips to emphasize your look. Here you’ll find ideas and options for all kinds of occasions and events. I’ll introduce you to the best shirts to wear with your blue suit and delve into the appropriate accessories. Details matter. Exploring any clothing combination involves learning styling techniques that set you apart from the crowd. Your signature look is only complete when all your components fit seamlessly together. And there’s a lot of components to choose. From shoes and accessories to shirts and ties. You’re looking for that ‘je ne sais quoi‘ that gives your outfit that certain something special. This is where your blue suit excels. Blue is a fantastic base color to work with. Think of it as the canvas to which you as the artist can add sweeping strokes with the combo and accessories brush. Almost any color will complement your blue foundation. White shirts are always a winner. But black, pink, and red all work well, to name just a few. Add a contrasting tie, brown or black shoes with a matching belt, and you’re guaranteed to be turning heads at your next event. To be clear, I’m not condoning a wild, color free-for-all here. 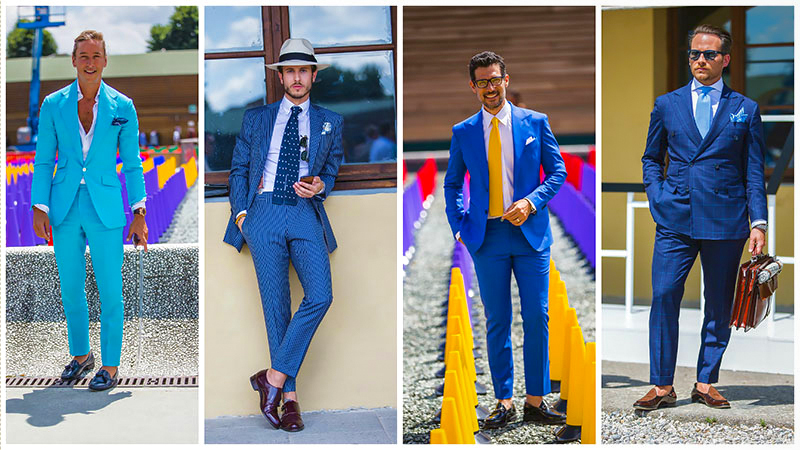 True, the real beauty of a blue suit is that it’s so darn versatile. But that doesn’t mean you can throw everything together in a haphazard frenzy. To a greater or lesser extent, colors need to fit together, or they should create an impact through measured contrast. Texture matters too. A thin wool tie on a silk dress shirt just won’t work, regardless if the colors match or not. But there’s no need to worry if your color sense isn’t quite up to par. There’s a handy tool that can help you decide which colors and tones go with what. That tool is called the Color Wheel. The color wheel tool helps us establish the basis of all color combos. Understanding the wheel allows you to explore different combinations, concepts and styles. As you can see, the color wheel is split into cold and warm colors. The cool, calm colors are on the left, and the warmer, more vibrant colors are on the right. The color wheel enables you to create, near-to-perfect matching combinations. But be aware that the wheel is meant to be a guide only. There are no hard and fast rules. The single color scheme leads to the same color combination for your suit, shirt, and tie. This is the most straight forward scheme to achieve and is a great place to start for every outfit. All you need is to match darker and lighter shades of the same color. A mid blue suit with a light blue shirt and a dark blue tie is a great example of this. With the analog scheme, you match up similar colors. 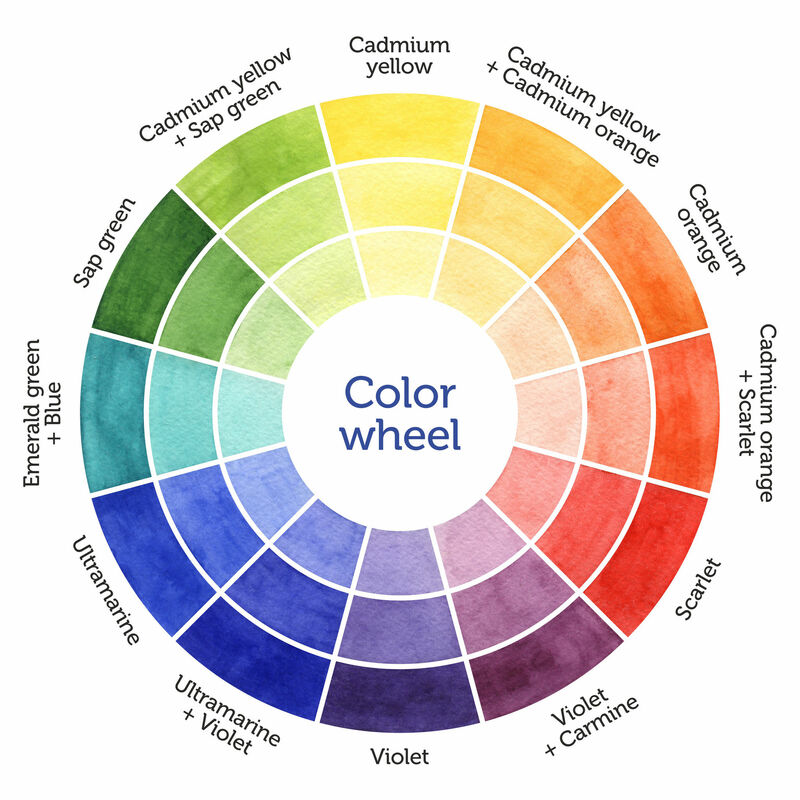 If you look at the wheel, you can see that similar colors are neighboring colors, i.e. they are adjacent colors. This means you can wear a warm tie with a slightly cooler suit and shirt. Analog color schemes can be very pleasing to the human eye. As an example of this color scheme, you can match a blue suit with a light purple shirt and slightly darker shade of purple tie. Looks good, doesn’t it? Here you can match colors three slots apart from each other. The contrast combo brings harmony to your look but can be difficult to visualize. Blue and red, for example, are opposite sides of the wheel. So, they should clash. The trick here is to pair the darker tones of each component. Match a scarlet tie with a light-blue shirt and a blue suit, and you’re sure to make an impact. These colors lie on opposing sides of the wheel. Which makes the complementary scheme one of the hardest to pull off. Experience helps here, but one rule of thumb states your tie should be darker than your shirt. 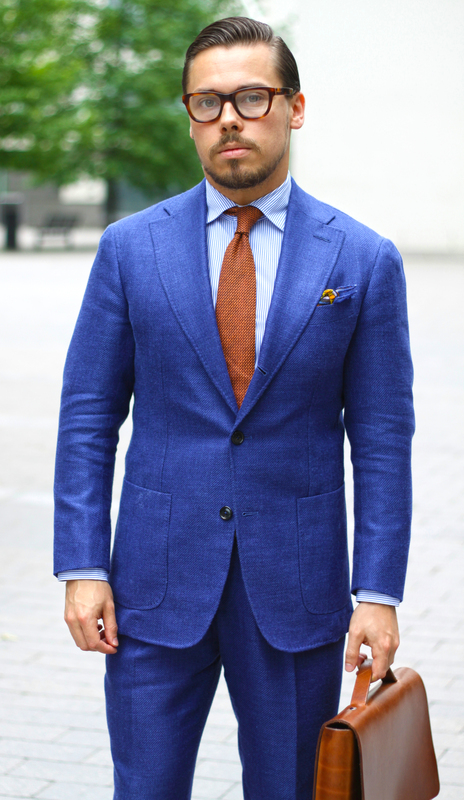 One perfect complimentary color scheme example will be matching a blue suit, a light-blue shirt and an orange tie. This combination is a real trend-setter nowadays. Want to explore deeper? Let’s say you wear your dark blue suit with a pale orange shirt. The ideal tie color could be either dark green or dark red. Sounds a bit wild? Not according to the color chart. Try it and see. Blue displays confidence, but so does the man in the suit. We’ve talked about how a suit should fit and its importance many times by now. Believe it or not, fitting your suit defines you. Thus, getting the correct fit and measurements is crucially important. 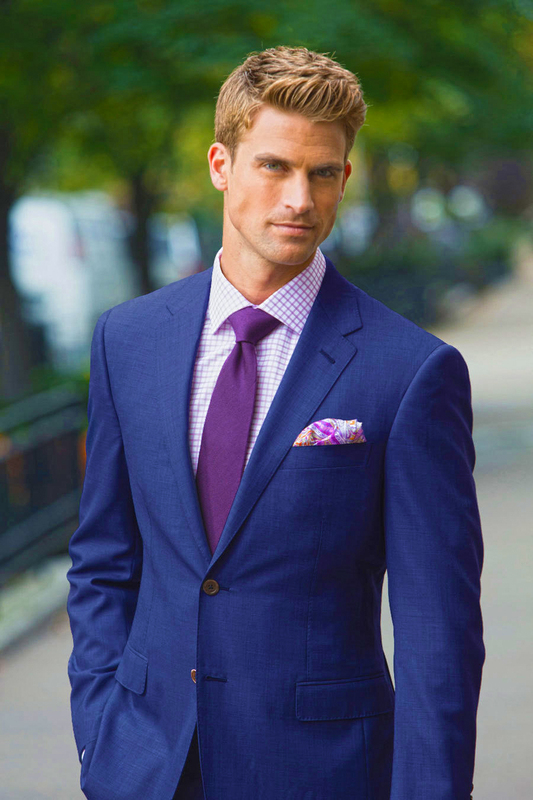 If your preferred fit is classic, blue can pair extremely well with the suit you’ve chosen. 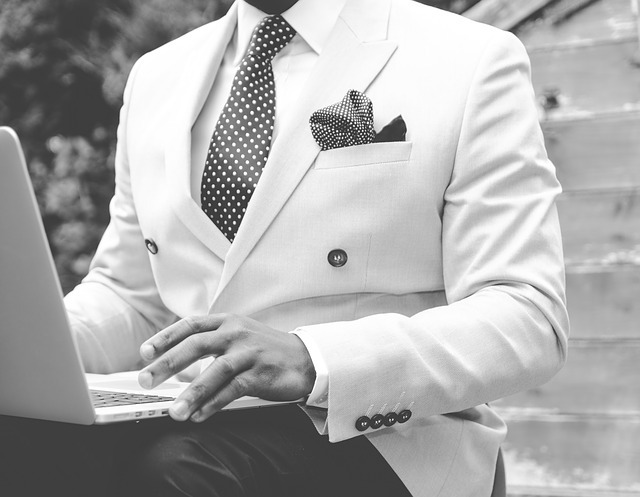 Classic fit suits are often chosen for work and business occasions, or any other formal events. As a matter of fact, they can be a marvelous choice for weddings, too. #1: Modern Fit Blue Suit by Tommy Hilfiger. #2: Haggar Premium Classic Fit Blue Suit Coat and Premium Classic Fit Blue Suit Pants (they come separately). #3: Haggar Active Classic Fit Blue Suit Coat and Active Classic Fit Blue Suit Pants (they come separately). #4: Three-Piece Classic Fit Blue Suit by P&L. 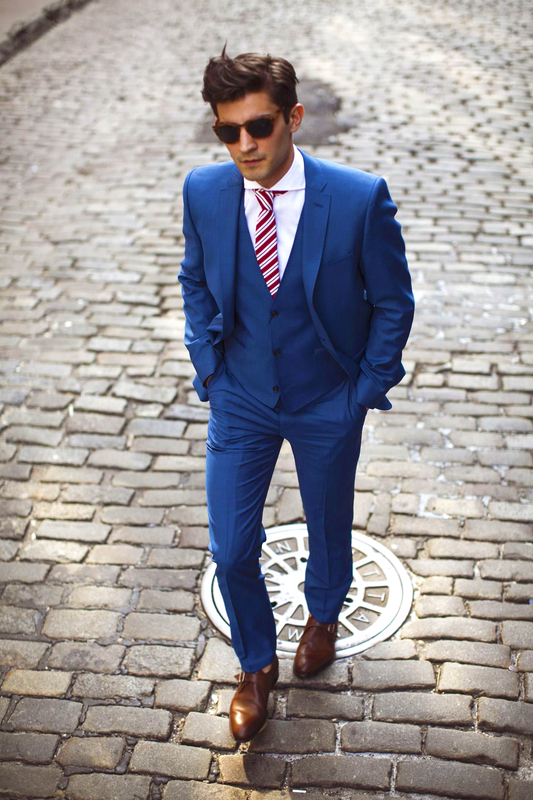 Blue slim fit suits are the trend-setters at the moment. Excellent for any occasion, they are one of the most popular choices by most of the people. Especially the young ones. If your body type is slim or skinny, boost it with extra confidence. Don’t hesitate to choose the blue suit. It will make you appear sharp, calm and luxury – all at the same time. #1: Slim Fit Wool Blue Suit by Calvin Klein. #2: Unlisted Slim Fit Blue Suit by Kenneth Cole. #3: Slim Fit Stretch Wool Blue Suit by Calvin Klein. #4: Reaction Stretch Slim Fit Blue Suit by Kenneth Cole. 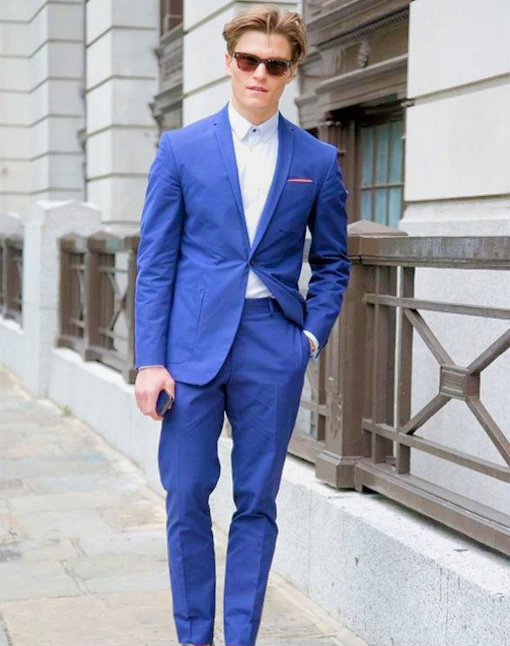 By now you’ve already figured out that the blue suit is a perfect base for any number of add-ons. And you’d be right. But where to start? Each shirt has its own distinctive features, silhouette, style element and color. When you’re choosing a shirt for your blue suit, consider all the various aspects of the shirt, besides color. You’re looking for a shirt that will embolden your blue look. Thus, you can never go wrong with a crisp and clean white shirt matched with a blue suit. Period. A tie adds the final flourish to your look. And again, your blue suit is the perfect canvas just waiting for the right tie to make a real statement. The tie can also be a subtle touch that projects quiet confidence and a relaxed ego. You decide! Ties have been essential menswear components since, well, forever. The right tie can transform your look and considerably up the appeal of your blue suit. Here are a few blue suit/shirt/tie combinations worth playing around with until you find what works for you. Remember, it’s not just the color of the tie that counts. The shape and texture play important roles too. 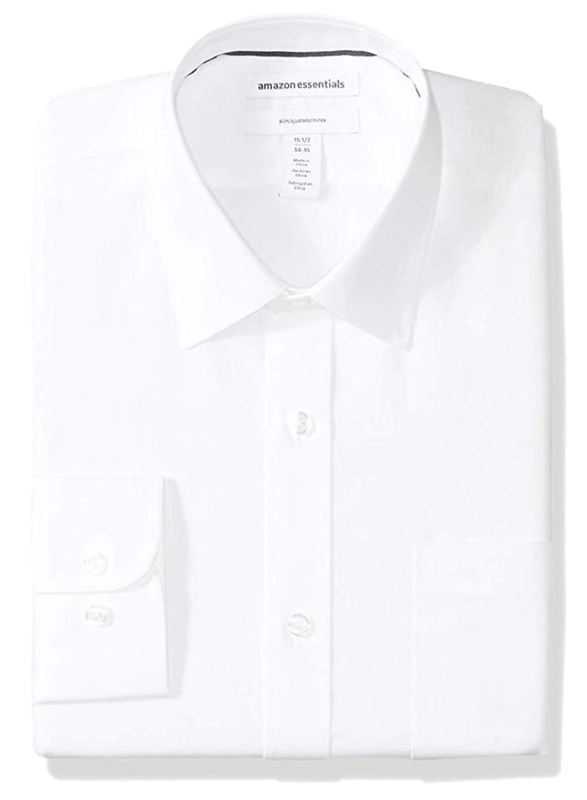 #1: Slim fit white shirt by Calvin Klein. #2: Regular fit white shirt by Van Hausen. 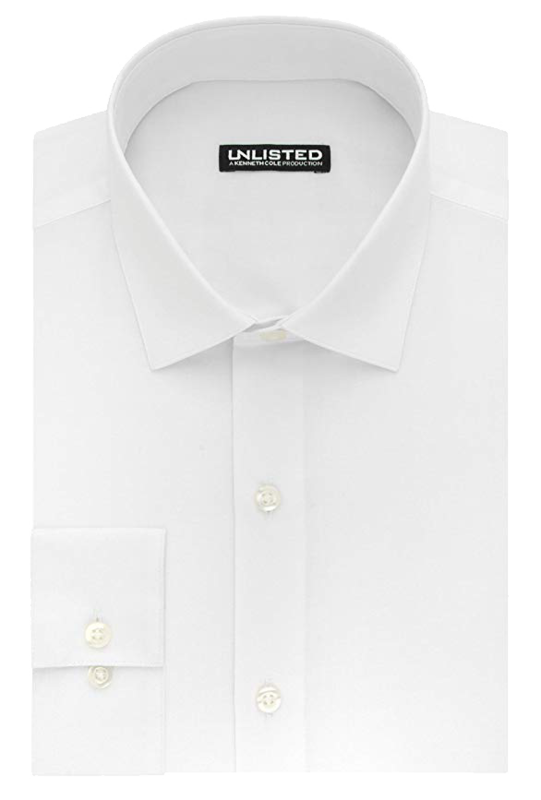 #3: Slim fit shirt in white color by Kenneth Cole. #4: Slim fit white shirt by Amazon Essentials. This is a truly eye-catching combo, and suitable for both formal and casual occasions. The warm red tie against the cool white shirt backdrop really pops. 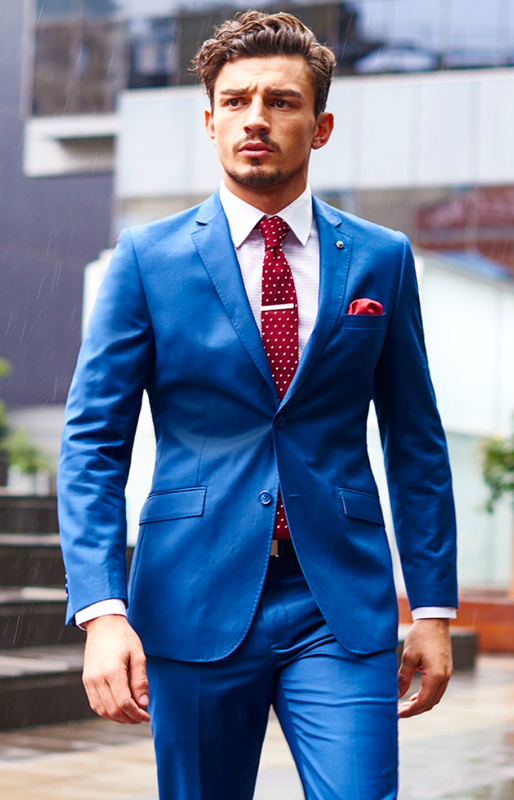 Your blue suit adds an attractive frame to the ensemble. Go for a patterned, or thin wollen tie and brown loafers for less formal events. 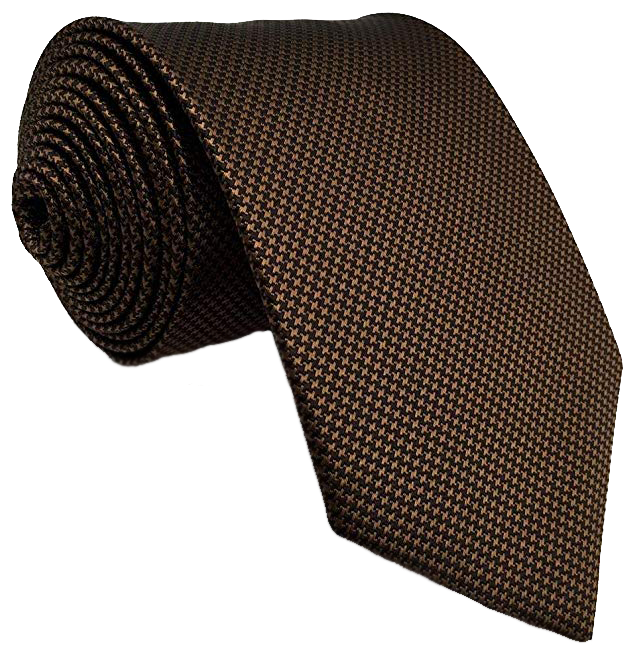 A wider, solid color silk tie with black dress shoes are perfect for those very special moments. The red shades can vary from light to burgundy, depending on the shade of your suit. Look to the color wheel for advice on choosing the right red tie for your blue suit white shirt combo. 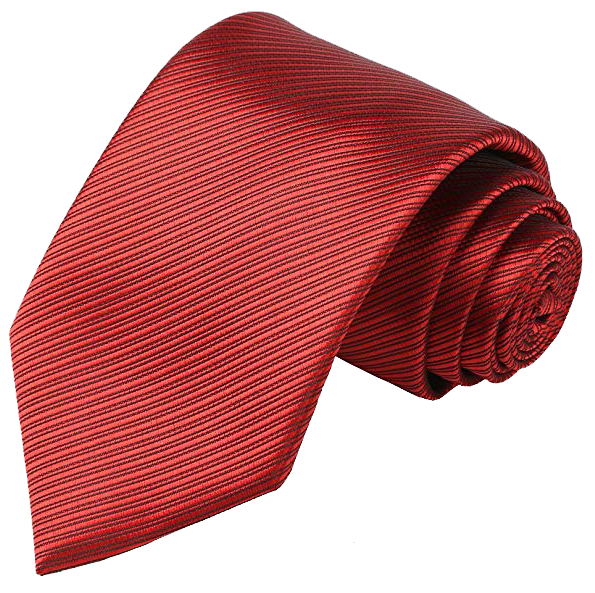 #1: Striped tie in red color by Kissties. 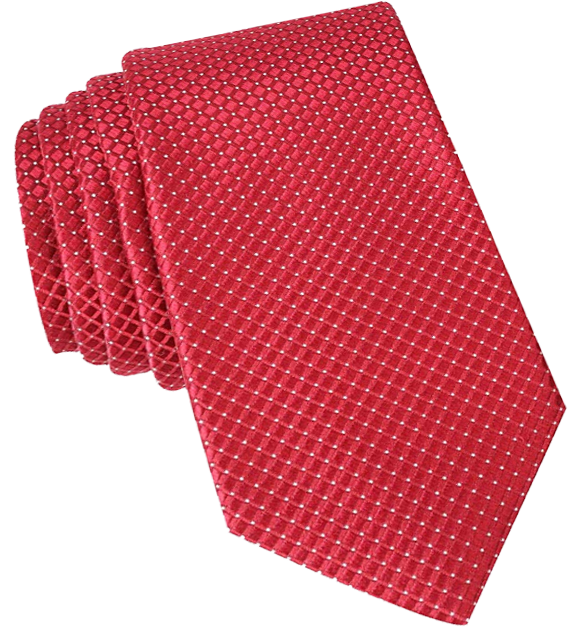 #2: Dotted tie – red color with white dots by Nautica. Gone are the days when the color pink was considered to be effeminate. Pink goes remarkably well with blue. It pops against the white shirt but adds a more subtle note than a powerful red. 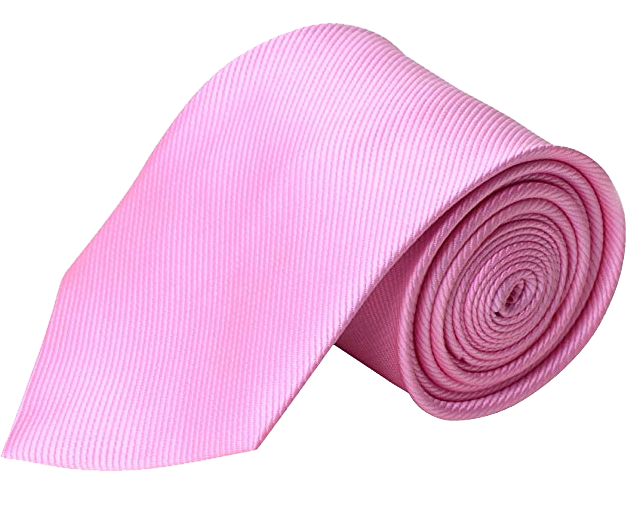 A mid-width, solid pink tie in silk will look great at any gathering. Pink will match with any shade of blue suit, but in my opinion, the color works better in summer. As such, you should combine the blue/white/pink look to black dress shoes with thin leather soles. Avoid shoes with thick rubber soles that remind us of winter. #1: Gingham tie: pink color with blue pattern by Secdtie. 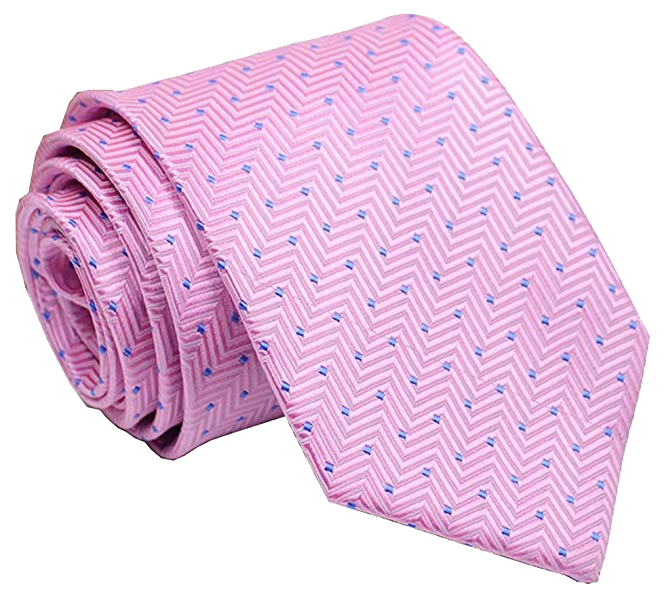 #2: Solid tie in pink color by QBSM. While a black suit and black tie have definite funereal connotations, especially when combined with a white shirt. The same cannot be said about the blue suit. This combination has ‘serious’ written all over it. It’s a great look for those tough business meetings and other occasions where you need to be in control. Thinner black ties of cashmere or silk work best. Rule of thumb says black tie pairs with black leather shoes, which goes along with a black leather belt. 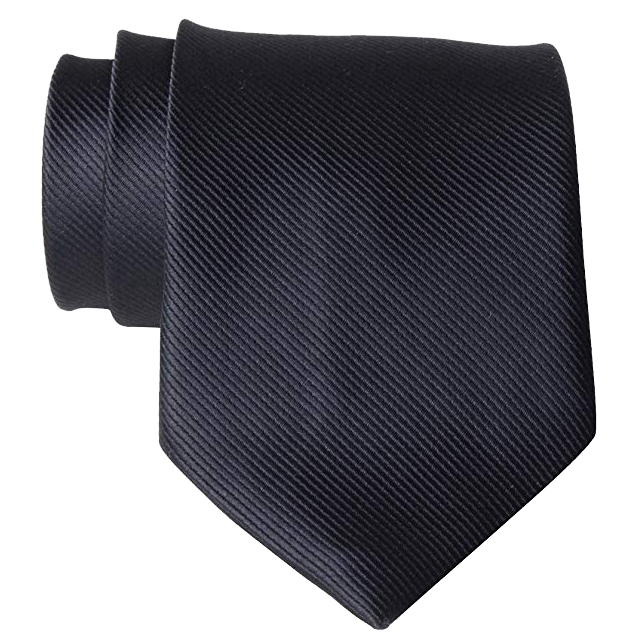 #1: Solid tie in black color by QBSM. 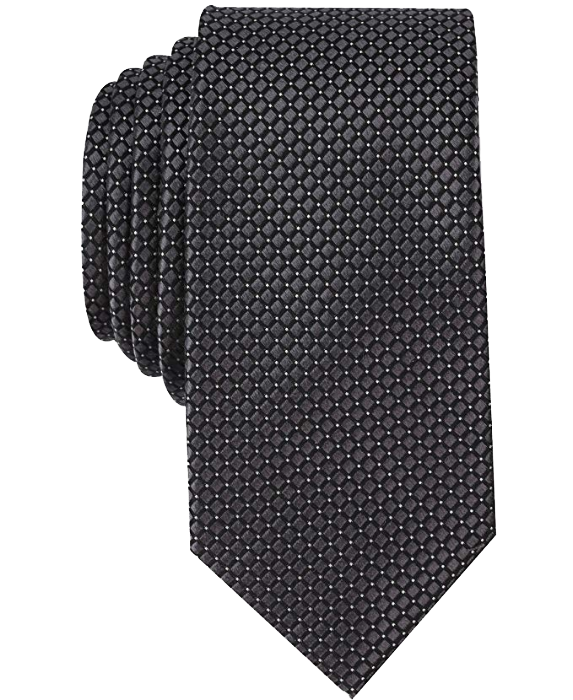 #2: Dotted tie Black color with white dots by Nautica. A blue tie with a blue suit and white shirt adds an interesting contrast to your outfit. Of course, you need to vary the shades of blue. If you wear a dark blue suit, choose a light, powder blue tie. A suit of lighter blue will call for a darker blue tie. As the two shade are closely related, it’s perfectly okay to go for a patterned, or striped tie here. Again, thin, wool or cashmere ties are great for relaxed, quasi-casual events. But the more formal the occasion, then change to silk and choose a wider tie. This look allows the choice of both brown or black shoes. 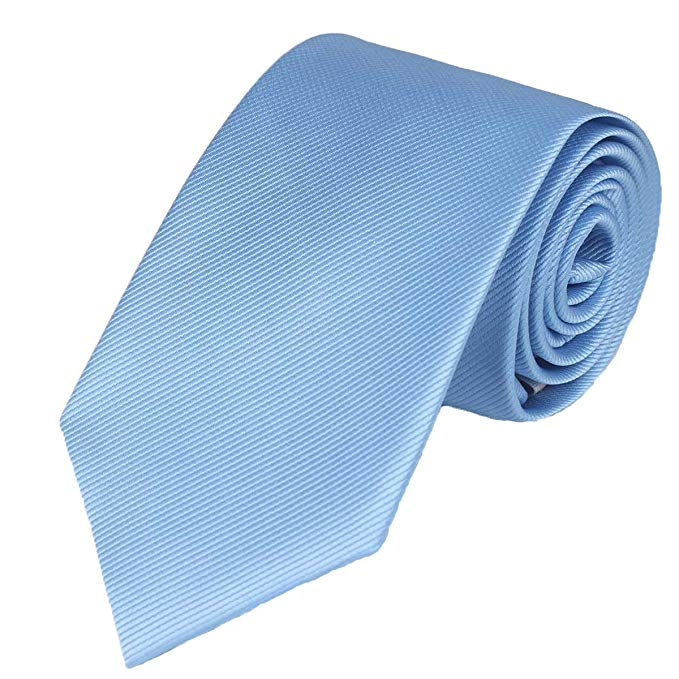 #1: Solid sky blue tie by Witzroys. 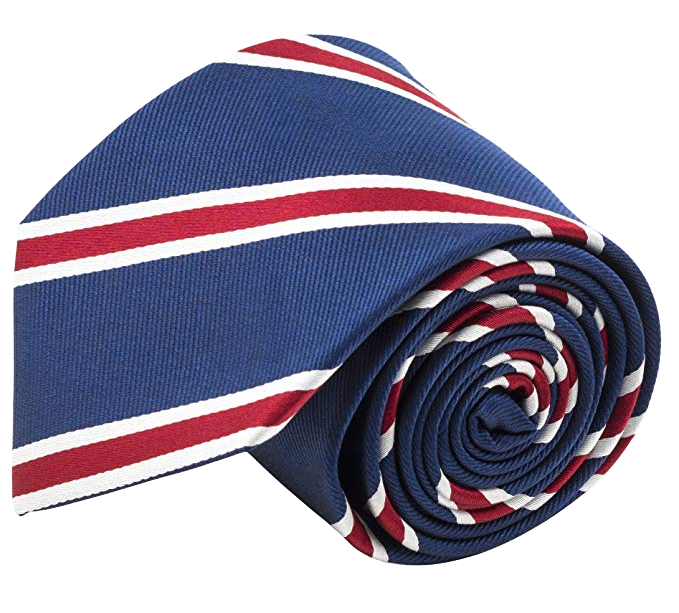 #2: Striped blue tie with red stripes by CPH. 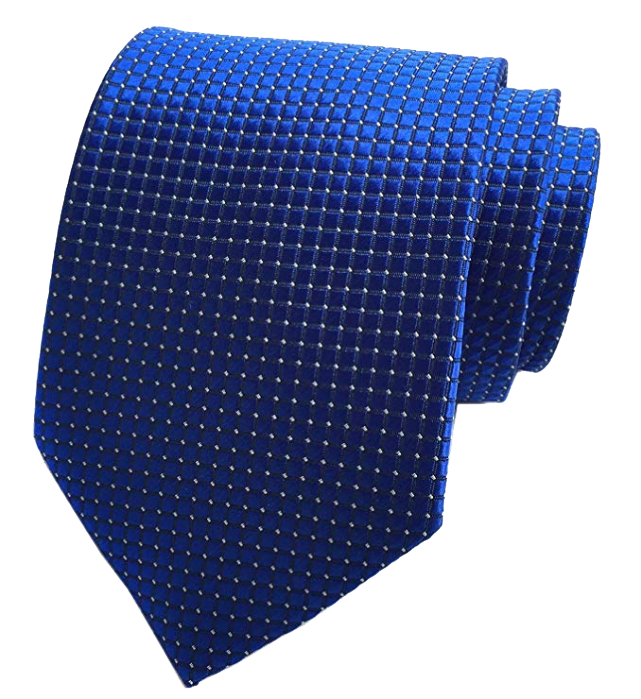 #3: Dotted royal blue tie by Elfeves. Navy is always a safe choice. Both as a suit and as a tie. But as we’re talking about every other shade of blue suit besides navy, a navy tie can be an interesting option. More formal than casual, the combination works well with wider, high-quality silk or satin ties. Go for patterned, or ties with thin white stripes to compliment the white shirt backdrop. You could get away with shiny brown brogues with this look. But a black leather dress shoe is probably the best option. 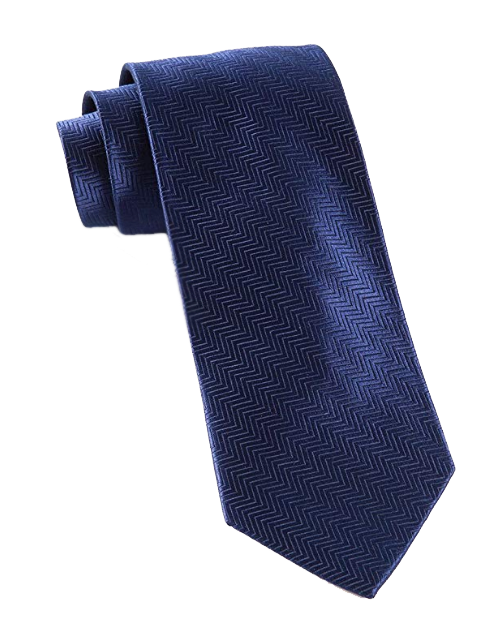 #1: Solid navy tie by Tie Bar. 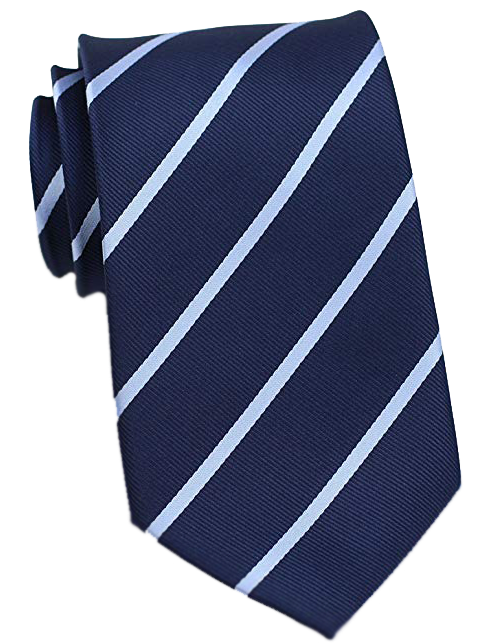 #2: British-striped navy blue tie by Retreez. #3: Striped navy tie by Bows&Ties. At first glance, brown is not an obvious choice to go with a blue suit. But you can consider brown as basically a very dark version of orange. And seeing as orange is a complimentary color to blue, the combination starts to make a lot of sense. Brown ties lend themselves to wool and cashmere. Or even cotton, depending on the formality of the occasion. Brown shoes are an obvious choice here, as is the belt, which should always be of leather. #1: Foulard brown tie by Shlax & Wing. 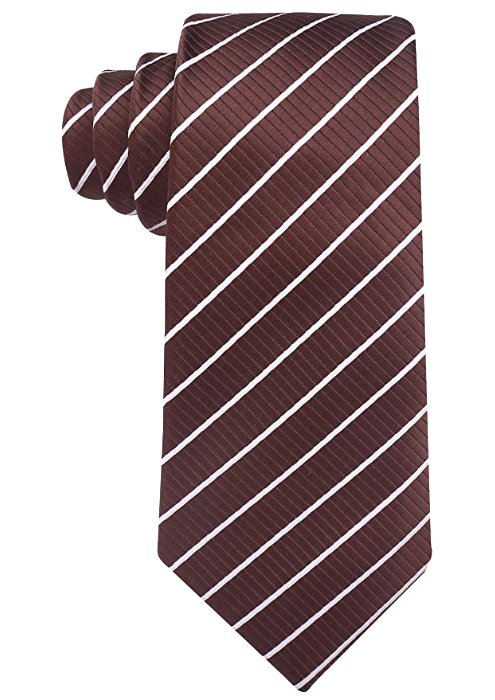 #2: Striped brown with white tie by Scott Allan. We’ve already established that a pink/blue combo is a pretty smart choice. A pink shirt pulls off the feat of contrasting with your blue suit in a way that is pleasing to the eye. But the color works far more subtle than a white shirt. The color wheel tells us that pink is a lighter version of red, yet it has carved a place in the fashion world entirely on its own merit. 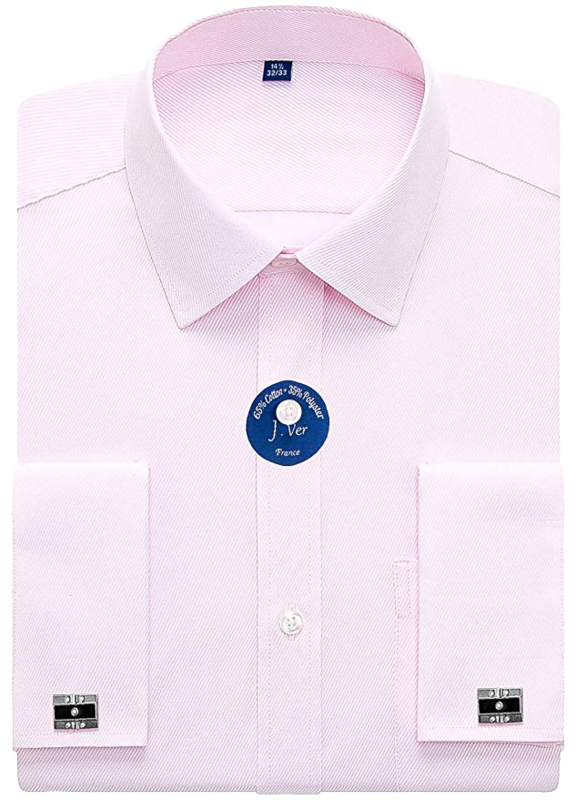 A powder pink shirt will go with just about any shade of blue suit. The softness of the pink works best in warmer seasons and climates. 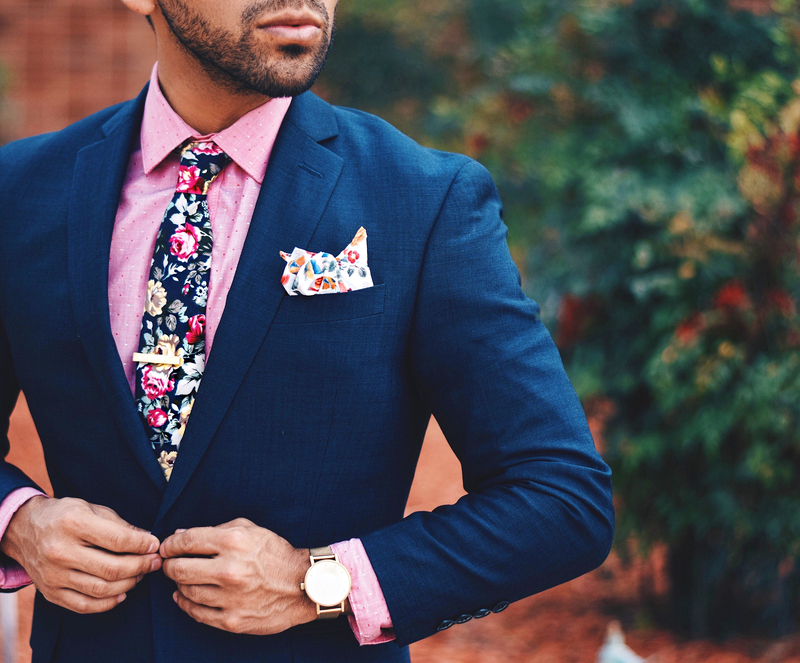 Add a specific color tie to your pink shirt/blue suit outfit to create an eye-catching en vogue statement. As I’ve already mentioned, pink is a lighter shade of red. So pairing a pink shirt with a red tie seems an obvious thing to do. But because the two colors are so closely related, you need to go all out to create a contrast. 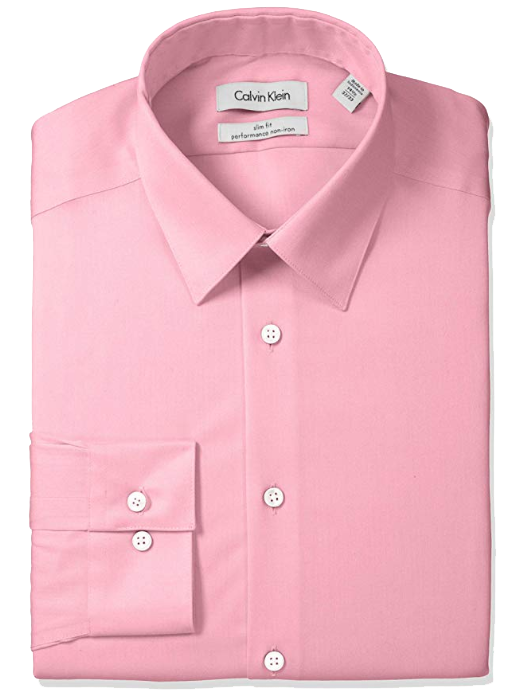 Pair a powerful red tie of finest silk with a pale pink shirt. 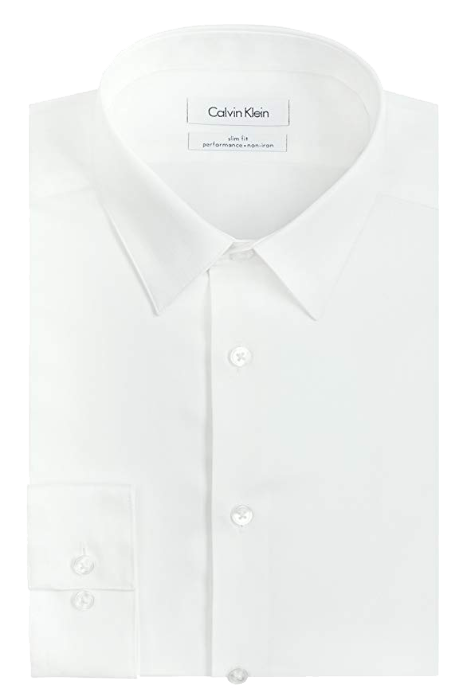 If your shirt is cotton, a thinner wool or cotton tie works too. Keep the knot mid to small. The combo of blue, red and pink simply cries out for brown shoes and matching belt. Any same-color combo can be tough to achieve with success. But it will make a real impression if you do pull it off. The trick here is to mix things up. A patterned suit with a plain shirt and a patterned tie. Or a plain suit with a patterned shirt and a plain tie. You get the picture. If you must go plain shirt and solid color tie, a darker tie on a lighter shirt is probably the best option. Black or brown shoes and belt with this look, according to the occasion. Purple is the color of kings. It’s also closely related to the red/pink family of color shades. A wide, purple tie can be problematic with a blue suit, but the pink shirt serves well to facilitate the transition from one color to the other. The royal color deserves the finest material, so a tie made from high-quality silk is recommended. Also, go for the full Windsor knot to top off the regal look. Black or brown leather shoes and belt, according to mood and formality of the event. This is a particularly neat combo option for your blue suit outfit. Different shades of blue suit and tie matched with a powder pink shirt can create an elegant, well thought-through impact. People will notice you haven’t just thrown your outfit together. A mid-width, cashmere tie and brown, smart and non-scuffed loafers work well here. Alternatively, a thin striped silk tie can be paired with black leather shoes. Your belt should always match your shoes. This combo works as above but adds a subtle note of refinement. The navy tie helps to ground your outfit, and leans to the side of formal, rather than relaxed. Navy lends itself naturally to patterns and stripes, but don’t go overboard. Subtlety is key. A darker, wool tie is perfect to combine with a light blue suit. This is one of the occasions when you could even pull off a pink shirt of a more powerful tone. Both black or brown shoes, highly polished and in good condition, can complete the look. The unicolor combination can be hard work to get right. Yet the impact when you do pull it off can make all that effort worthwhile. Wearing a blue shirt with your blue suit creates a smooth blend of shade and texture that can be very easy on the eye. It’s a look that is comfortable at any event, both formal and informal. Shades is the operative word here. 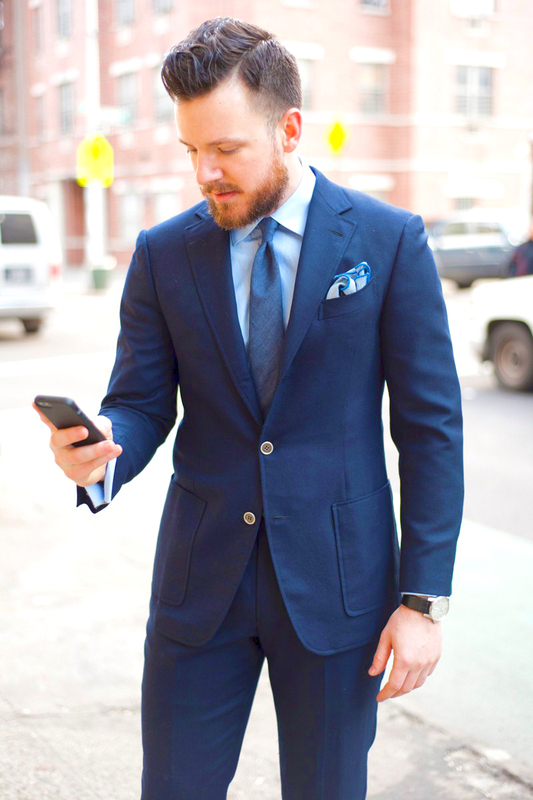 A dark blue suit coupled with a light blue shirt, or vice verse, can still create a high level of contrast. This is despite both shades belonging to the same color family. In which case, the choice of tie color is a relatively simple matter. The tie will build a bridge between the two blues. You can also match blue tones that are a lot closer together on the color wheel. Here, the tie will have to work a lot harder to add balance and harmony to the look. Here are a few more examples of the best tie colors for a blue suit blue shirt combo. 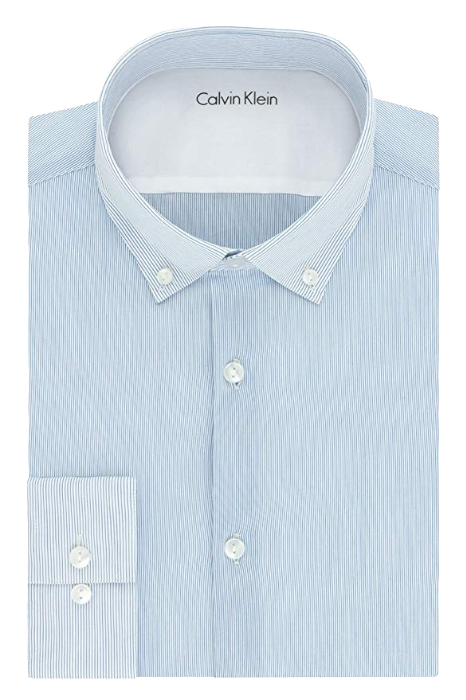 #1: Slim fit blue-striped white shirt by Calvin Klein. #2: Slim fit blue shirt by Kenneth Cole. 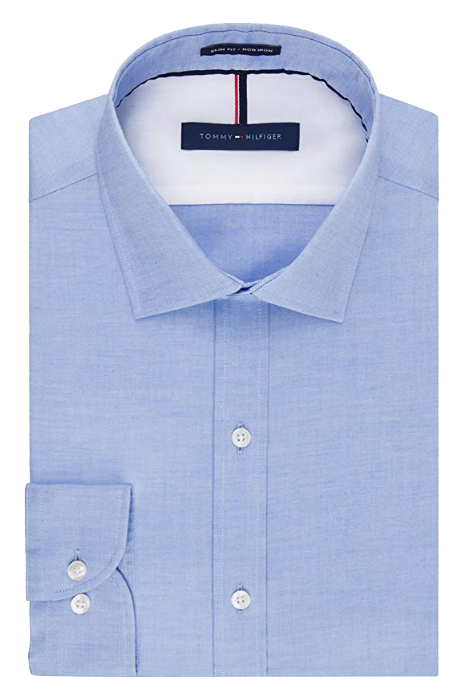 #3: Slim fit blue shirt by Tommy Hilfiger. 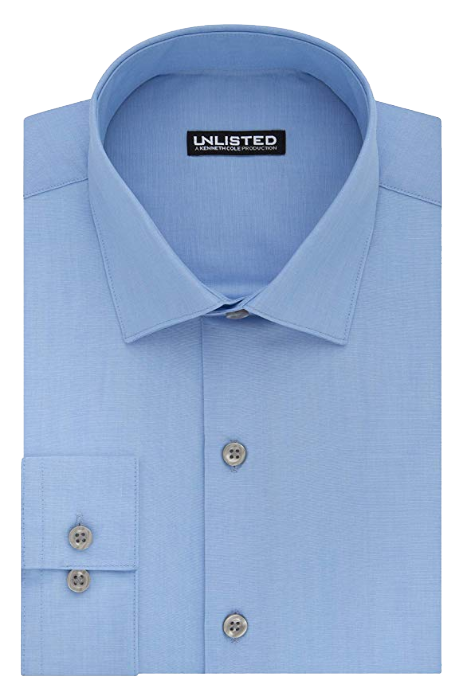 #4: Classic Fit Blue Shirt by Buttoned Down. You can go for broke with a red tie. It’s the strongest color on the wheel, so why be timid about the shade? A powerful red tie will automatically attract attention because the color is embedded in our DNA. Which means that it works well when your suit and shirt are of a similar shade. Cotton or wool ties are acceptable for most occasions but go for classy silk at special events. Patterns or stripes are allowed too, adding a sense of adventure to your outfit. Black or brown patent leather shoes, coupled with a matching belt complete the look. There’s a danger of appearing bland when you wear this combination. So you need to take extra care with the shades and textures of your outfit. Basically, if you stick to the color wheel, you can work with the three shades of blue that are right next to each other. When done well, this can create a harmonious, balanced look. Go for a wide, silk tie with thin white stripes or patterns to add a minor, but noticeable contrast. They can help break up the subtle monotony of the blue on blue look. Brown shoes will be out of place here, so go for thin-soled, shiny black leather at formal events, along with a black leather belt. Again, you’re working with similar shades, so the same tips apply. The navy tie has earned a place of its own in the world of men’s fashion. Reason enough then to make your tie the star of the show. A wide, white polka dot navy tie of silk or satin will draw admiring glances. But a thin, red striped woolen tie will work too. Keep your suit and shirt shades of blue tight, and wear black leather shoes and belt. The result is a sleek look that can be interpreted as professional competence or cool confidence. Or even both. Along with white, black is a special color. It’s special because unlike every other color except white, there are no shades of black. If you have an off-black shirt, it’s either dark grey or dark blue. Black, as the song says, is black. There’s a school of thought out there that tells us that you can only wear black if you have dark hair and a darkish complexion. The reasoning is that a pale face and light har will work garish on top of a black outfit. I disagree to some extent, but it’s a point worth keeping in mind when you’re putting your outfit together. Black is a grounding color and it’s related to blue on the color wheel. So, even though it might not be an obvious choice, the pairing does make sense. In my opinion, a black shirt works best with a mid to light blue suit. A really dark blue suit worn together with a black shirt could give the impression you’re unaware of the difference. The right tie can make a positive impact here, carrying off one of two jobs. It can bridge the divide between your suit and shirt. Or it can make a statement about your character, your ego, and your state of mind. Let’s take a look at some blue suit/black shirt/tie combos. 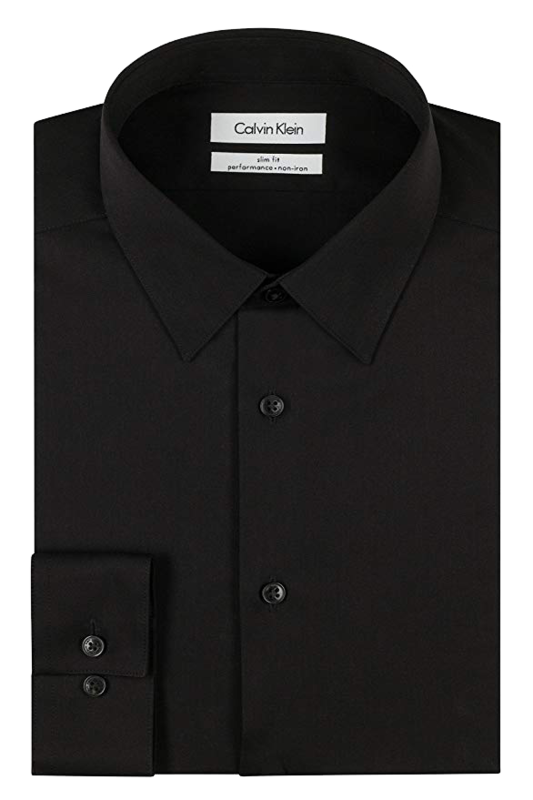 #1: Slim fit black shirt by Calvin Klein. 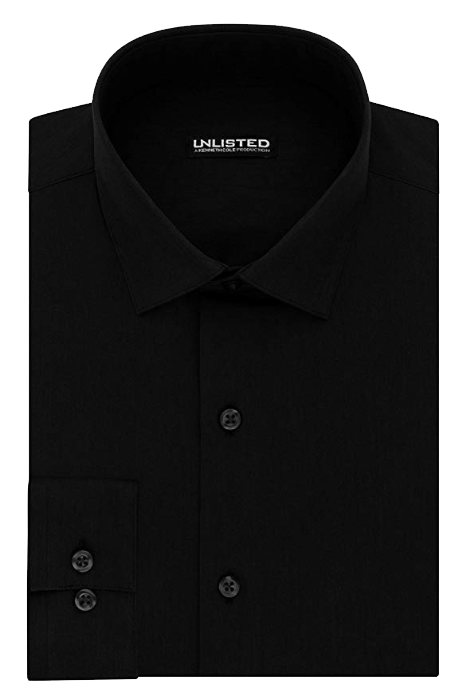 #2: Slim fit black shirt by Kenneth Cole. 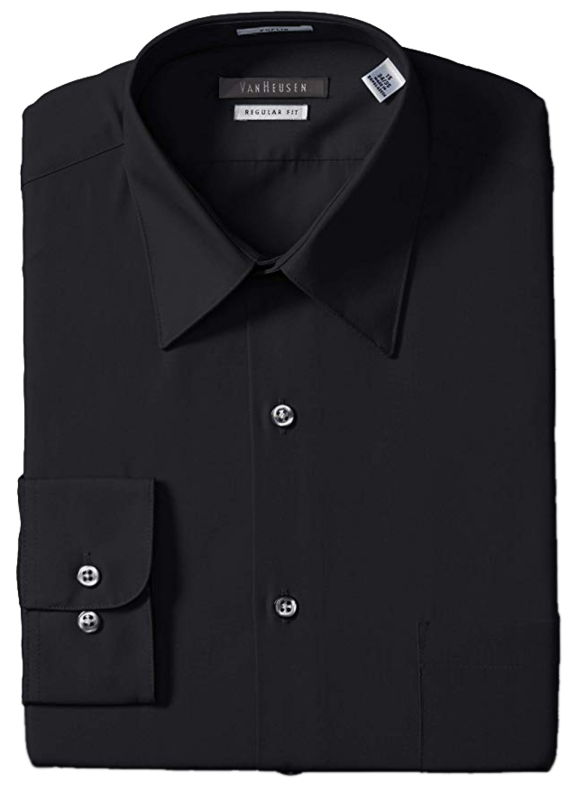 #3: Regular fit black shirt by Van Heusen. This combo falls definitely into the statement category. As there is only one black, the tie will blend seamlessly with the shirt. 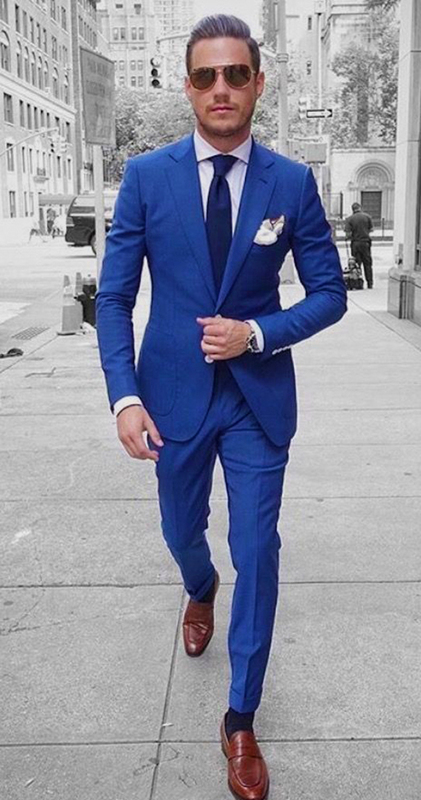 This creates a solid color effect that nicely offsets your blue suit. Shirt and tie become one here, so match the textures and fabrics. Silk shirt? Wear a silk tie. Cotton shirt? Then you need a cotton tie. Width doesn’t play a huge role here so go for whatever you’re comfortable with. If you’re aiming for a less strict look, choose a tie with bold stripes or patterns. And of course, black shoes and belt. If the black tie was making a statement, then the blue tie in your blue suit/black shirt combination works well as a bridge. This is one of those ensembles where you can match your tie extremely close to the color of your suit. The black shirt acts as an almost invisible backdrop for the tie, giving your outfit a balanced look. Keep the tie’s texture in line with the material of your suit. Personally, I would never wear brown shoes with a black shirt. I’d feel much more comfortable thin-soled black leather with a belt to match. But this is not a hard and fast rule. It all depends on the occasion and your mood. For this combo, your choice of navy tie has already created a subtle contrast to your blue suit. Here you could go for a slightly darker suit, as the black shirt will complement the gentle transition from blue to black to navy. 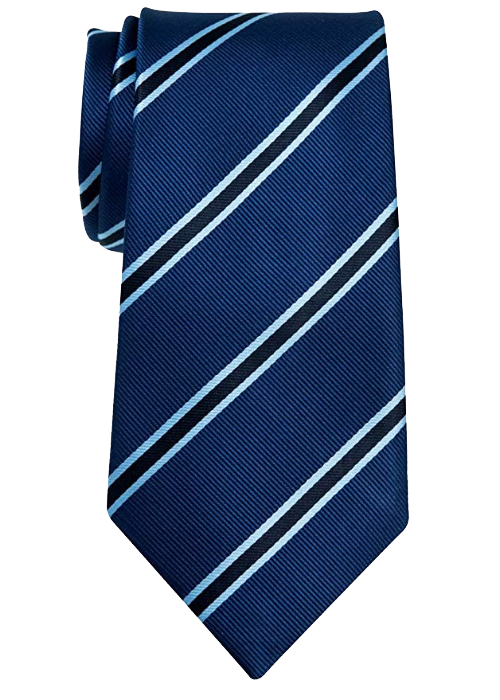 Navy ties look their best when thinly striped or polka dotted and manufactured in silk or wool. Go for a mid-width tie, or at least lean towards ties on the thinner side. Black patent shoes and a matching belt will always go better with this elegant combo, rather than brown. White shirts look great with suits in just about every shade of blue. For more formal events, or for the office, blue or brown shoes hardly ever look out of place when paired with a blue suit. But don’t forget to add the correct style elements too. Button up for the classic touch on official occasions. Or go sockless and opt for a pair of spotless white sneakers to create a casual, clean image. If you’re after the perfect look for a warm, summer’s day, congratulations. You’ve nailed it! Once you’ve figured out which blue suit/shirt combo works best, you need to decide on a tie. 100% cotton ties in black are good, so too are red, blue, and burgundy in silk or wool. Wider ties are more appropriate for formal events. If you’re aiming for smart but casual, you can go with a thinner, wool tie. Alternatively, top off your blue suit combo with a silk bow tie, and you’re guaranteed to achieve the WOW! factor.